Clark County Sheriff Joe Lombardo responds to a question during a media briefing at the Las Vegas Metro Police headquarters in Las Vegas, Oct. 3, 2017. While investigators attempt to unravel the reason for the worst mass shooting in recent U.S. history, President Donald Trump went to Las Vegas to console victims and meet with police and other first responders. Trump, speaking next to first lady Melania Trump, on Wednesday praised the emergency workers and medical staff who responded to Sunday’s massacre. 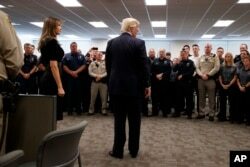 President Donald Trump and first lady Melania Trump meet with first responders at the Las Vegas Metropolitan Police Department, Oct. 4, 2017, in Las Vegas. ​He added more praise on Twitter Thursday morning. "So wonderful to be in Las Vegas yesterday and meet with people, from police to doctors to the victims themselves, who I will never forget!" Meanwhile, Las Vegas Metropolitan Police Department Sheriff Joe Lombardo said it is crucial to talk to anyone who knew gunman Stephen Paddock in the hunt for possible accomplices. Considering the number of weapons Paddock collected and explosives he had stockpiled in his car, Lombardo told reporters he finds it hard to believe Paddock could have carried out the massacre on his own. On Sunday night, Paddock fired into a crowd attending a country music concert across from the Mandalay Bay hotel, killing 58. Lombardo said Paddock spent decades living what he calls a “secret life” and that concealing his activities all those years was well thought out. But the sheriff declined to provide any details on what has been uncovered so far about Paddock because he said he does not want to say something that could drive anyone with information underground. Lombardo said there were signs in Paddock’s hotel room that he planned to escape after his shooting rampage. Paddock shot himself in the mouth as police zeroed in on his room. FILE - Clark County Sheriff Joe Lombardo speaks at a press conference, June 5, 2017, in Las Vegas, Nev. The sheriff also said Paddock had taken a room in another Las Vegas hotel one week earlier while an alternative music festival was in town. But it is unclear what his intent was. The number of wounded in the Sunday night massacre has been lowered from more than 500 to 489. Lombardo said some victims were counted twice in the confusion following the shooting. Earlier Wednesday, the lawyer for Paddock’s girlfriend, Marilou Danley, said Danley had no idea Paddock was planning any violence. This undated photo provided by the Las Vegas Metropolitan Police Department shows Marilou Danley. Danley, 62, returned to the United States from the Philippines on Oct. 3, 2017, and was met at Los Angeles International Airport by FBI agents. “He never said anything to me or took any action that I was aware of that I understood in any way to be a warning that something horrible like this was going to happen,” Danley said in a statement read by her attorney, Matthew Lombard. Danley spent much of the day being questioned by FBI agents in Los Angeles, where she arrived from the Philippines. Her attorney said she was in the Philippines to visit family. Paddock sent her $100,000 while she was there, telling her to buy a house. 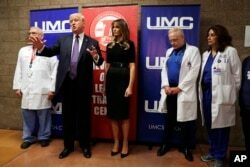 President Donald Trump talks as first lady Melania Trump and surgeon Dr. John Fildes, left, listens at the University Medical Center after Trump met with survivors of the mass shooting, Oct. 4, 2017, in Las Vegas. The president and first lady, at University Medical Center, met with eight families of those who had been wounded and also went to the bedsides of some who had been shot, White House Press Secretary Sarah Huckabee Sanders said. During prepared remarks, in front of police officers and Nevada politicians on a stage at local police headquarters, Trump said, “We cannot be defined by the evil that threatens us,” noting that “Americans defied death and hatred with love and with courage” in selflessly coming to aid of others at peril to their own lives at the concert. Route 91 Festival goers, tourists and residents of Las Vegas placed candles, flowers, banners and photos of their loved ones at the shrine on the median just across the street from shooting site at the country music festival. There is currently no evidence to indicate the shooting was terrorism, FBI Special Agent in Charge Aaron Rouse told reporters in Las Vegas on Wednesday. 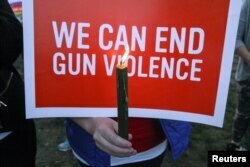 Mourners hold signs during a solidarity vigil in memory of victims of the Las Vegas music festival mass killing, in Newtown, Connecticut, site of the 2012 Sandy Hook school shooting, Oct. 4, 2017. Investigators found 23 guns inside Paddock’s hotel room and 12 so-called “bump stock” devices that can enable a rifle to fire continuously. The gunman also set up multiple cameras looking out into the hallway outside the room, apparently to monitor the police response. Sheriff Lombardo said Paddock fired about 200 rounds of ammunition into the hallway outside his suite, wounding a security guard who had come to investigate. The wounded guard stayed in place to help police despite his injuries. Another 26 guns were found at two of Paddock’s homes in the state of Nevada. 'Bump Stocks' Now at Center of US Gun Debate, But What Are They?